Of all the flight and launch vehicles NASA operates, none is perhaps as persnickety when it comes to weather as a scientific balloon. And of the two main types of balloons NASA flies—zero pressure and super pressure balloons—the super pressure is the most persnickety of all. For launch, winds need to be light and flowing in a reliable direction both at the surface and at low-levels up to 300 meters (winds flowing in opposite directions on the ground and lower levels could have a shearing effect on the balloon). In addition, the balloon needs to launch into a weather phenomenon known as the stratospheric winter cyclone, characterized by wind vectors traveling easterly about Antarctica with the cyclonic behavior extending into the southern hemisphere’s mid-latitudes. For NASA’s Super Pressure Balloon campaign in Wanaka, New Zealand, the past two days—March 29 and 30—have been near perfect days to locals and visitors alike: low wind, abundant sun, warm weather (but not too warm). This graphic of the stratospheric winds at a pressure altitude of 7 millibars, roughly 33.5 km or 110,000 feet, valid as of March 29, shows the winter stratospheric cyclone about Antarctica set-up, but with a pocket of light, variable winds above the balloon program’s Wanaka, NZ, launch site. However, some 33.5 kilometers high in the stratosphere, a small eddy developed above Wanaka characterized by very light, variable stratospheric winds. Along with winds being just slightly too fast at the surface and thus not conducive for launch, launching into these types of stratospheric conditions would have led to the balloon slowly meandering above the region for an extended period of time driving up risk factors beyond NASA’s stringent safety standards. Ideally, stratospheric winds will propel the balloon well to the east so that the balloon pressurizes and reaches its float altitude either over a largely unpopulated land area or, better yet, over the water. With rain forecast for most the weekend, the team continues to wait out Wanaka’s weather for a balloon-weather day. In the meantime, members of the team are engaged in a number of outreach activities around the area. 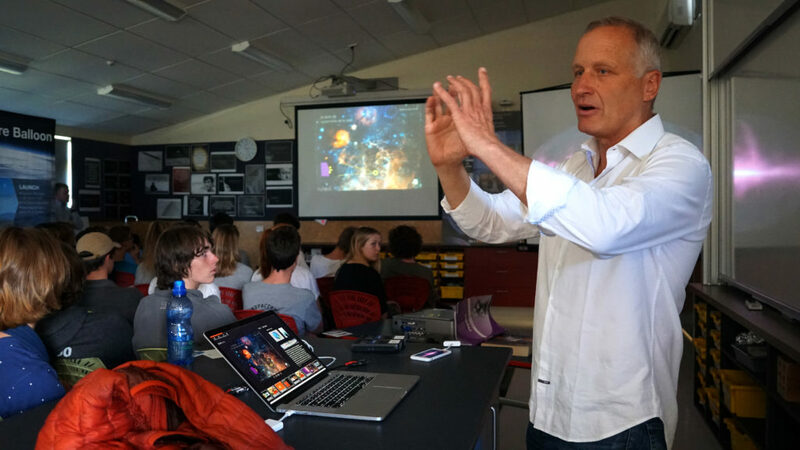 The Extreme Universe Space Observatory-Super Pressure Balloon team gave a presentation on their mission and related science topics to 12th graders from Wanaka’s Mount Aspiring College March 29 and 30. Additionally, members of the NASA and Columbia Scientific Balloon Facility teams attended the Wanaka Chamber of Commerce’s monthly meeting and reception March 29. Additional outreach activities are planned throughout the campaign. NASA’s next super pressure balloon (SPB) mission out of Wanaka, New Zealand, is enabling a pioneering method for studying high-energy cosmic rays from space using a detector looking down on the Earth’s atmosphere. 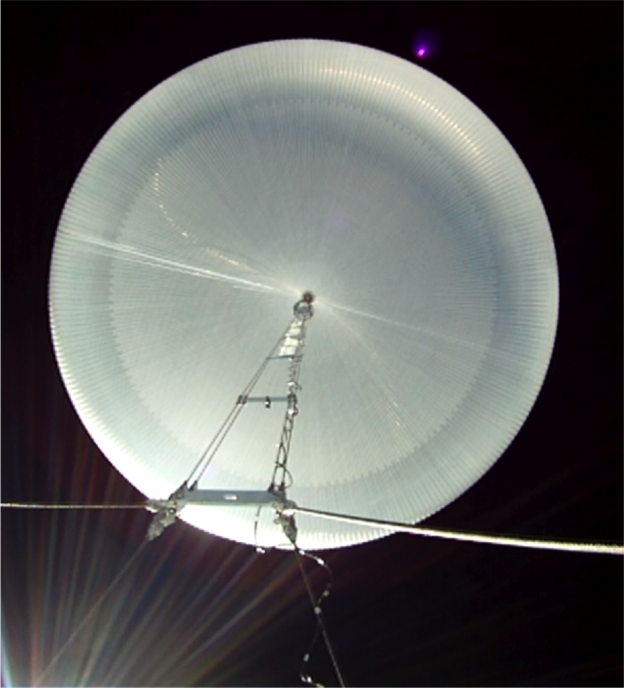 The Extreme Universe Space Observatory on a Super Pressure Balloon (EUSO-SPB) is a mission of opportunity flying on the 2017 SPB test flight with the goal of detecting high-energy cosmic rays from the farthest reaches of space as they penetrate the Earth’s atmosphere. As these high-energy particles enter the atmosphere, they interact with nitrogen molecules in the air and create a UV fluorescence light. EUSO will be flying at some 110,000 feet (33.5 km) looking down on a broad swathe of the Earth’s atmosphere to detect the UV fluorescence from these deep space cosmic rays coming in from above. Angela Olinto, professor at the University of Chicago and EUSO-SPB principal investigator, discusses the mission, science, and team behind it all in this video. The acting U.S. 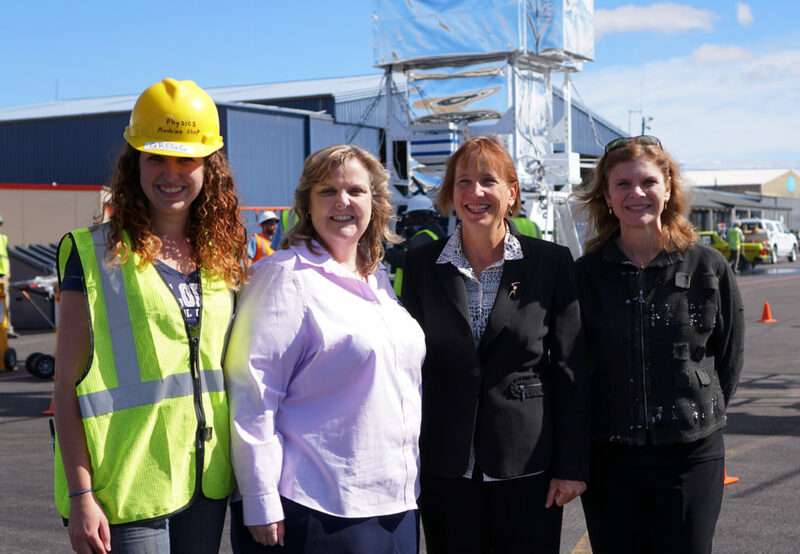 Ambassador to New Zealand, Chargé d’Affaires Candy Green, paid a visit to Wanaka Airport, New Zealand, March 23 to see first-hand NASA’s super pressure balloon operations, the science it supports, and the combined U.S.-Kiwi team behind it all. 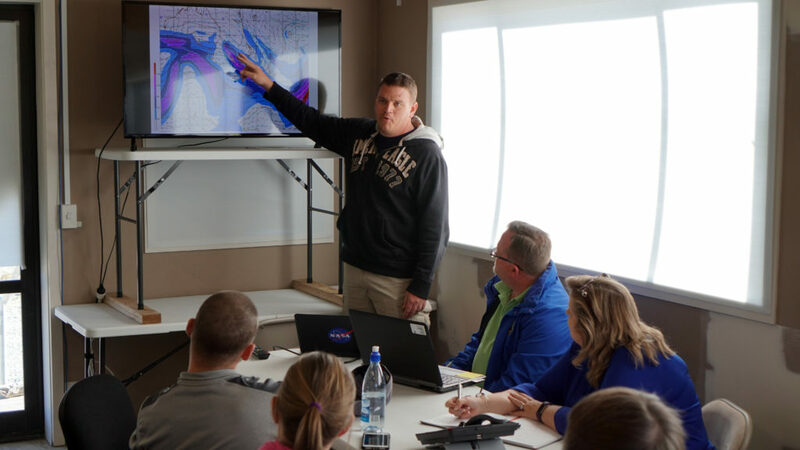 While on site, Green observed the final flight readiness test of the University of Chicago’s Extreme Universe Space Observatory-Super Pressure Balloon (EUSO-SPB) payload, received updates on this year’s campaign and toured NASA’s new balloon launch pad. In addition, Green presided over an impromptu NASA Honor Awards ceremony recognizing the contributions of a number of Kiwi officials crucial to establishing Wanaka as NASA’s mid-latitude, long-duration balloon facility. 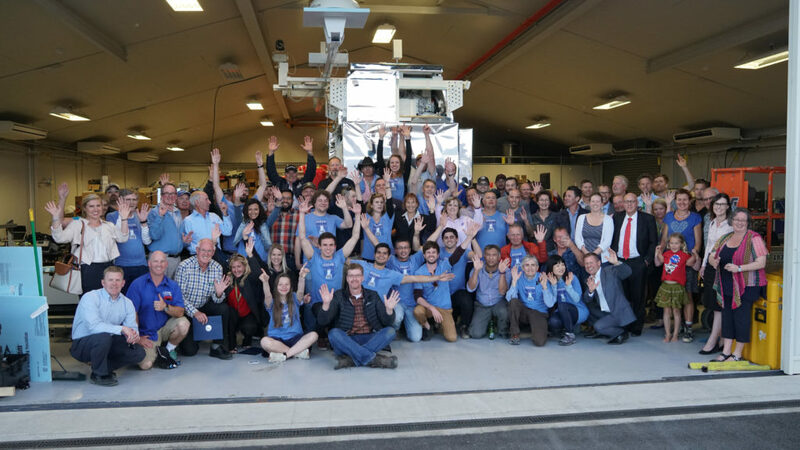 During the visit, NASA, the Wanaka Airport, and the Queenstown Airport Corporation played host to a “Locals Day” Open House event, with nearly 250 members of the local community attending to learn more about the super pressure balloon technology and the science it supports. The launch window for opened Saturday, March 25 (NZ time), however, the opening day did not present a launch opportunity due to forecast weather. Forecast winds are variable at times and otherwise not aligned in a direction that will support a launch opportunity. Winds need to be light and flowing in a reliably easterly direction to support a launch attempt. NASA’s Scientific Balloon Team kicked off a day-long hang test of the Extreme Universe Space Observatory-Super Pressure Balloon (EUSO-SPB) payload March 23, a key step to certifying the flight readiness of this year’s super pressure balloon mission lifting off from Wanaka, New Zealand. The hang test is a complete test of all primary balloon systems—tracking, telemetry, communications, and flight termination systems—as well as all redundant systems to ensure the flight readiness of the balloon and payload. Earlier in the day March 23, NASA leadership at headquarters and NASA’s Wallops Flight Facility, home to NASA’s Balloon Program, granted “Approval to Proceed” or ATP for this year’s mission. The launch window for the 2017 New Zealand super pressure balloon mission opens March 25. NASA will assess weather conditions day-to-day beginning Friday, March 24, to determine if conditions favor a next-day launch attempt. Current weather forecasts don’t appear favorable for a Saturday launch due to precipitation and winds; however, a final assessment won’t be made until March 24. Later today, March 23, the Wanaka Airport and the NASA and Science teams on-site will host a Locals Day Open House event from 4 to 6 p.m. at the Wanaka Airport main hangar. Visitors will have the opportunity to learn more about the super pressure balloon technology, the EUSO-SPB science instrument flying on this year’s mission, and to meet and talk with the engineers and scientists who make it all happen. For more information on the EUSO-SPB mission, see: http://astroserve.mines.edu/euso_spb/2017-spb.html. For more information on NASA’s Scientific Balloon program, see: www.nasa.gov/scientificballoons. While the launch window for NASA’s next Super Pressure Balloon launch from Wanaka, New Zealand, opens March 25, there are a number of factors that need to align prior to making an actual launch attempt. Operationally, all the balloon systems—power, communications, telemetry, etc.—need to be checked out and tested. Today, as seen in the accompanying video, the team completed a test integrating the balloon to the recovery parachute. Later this week, the team will conduct a hang test of the integrated payload/gondola—literally suspending the payload from the launch vehicle—to ensure system compatibility prior to operations. Administratively, NASA is working closely with the U.S. Department of State to secure overflight clearances from countries in the southern hemisphere that could potentially be in the balloon’s flight path. In addition, the team will have an “approval to proceed” meeting with senior managers later this week to ensure the flight readiness of the balloon. Finally, there’s Mother Nature, who has an ever-present seat at the table when it comes to deciding when to attempt a launch. Managers assess weather conditions 13 hours before the beginning of initial launch preparations to determine whether or not conditions are conducive for launch. Winds need to be light and flowing in a reliable direction both at the surface and at 300 meters (1,000 feet). Since the balloon flight train is nearly 300 meters long, an inconsistent wind pattern could cause a shearing effect once the balloon is launched. Also, winds in the stratosphere at a pressure altitude of 7 millibars (about 110,000 feet or 33.5 km) are key to watch as that is where the balloon will fly once launched. So, while NASA’s Balloon Team can confidently say the launch window will open March 25, the alignment of all these conditions (with Mother Nature issuing a final go for launch) may not occur at the beginning of the window. NASA will assess launch conditions daily and issue updates on whether or not a launch attempt is scheduled. And, so begins an incredible exercise of patience and flexibility that is the hallmark of any NASA balloon launch campaign. 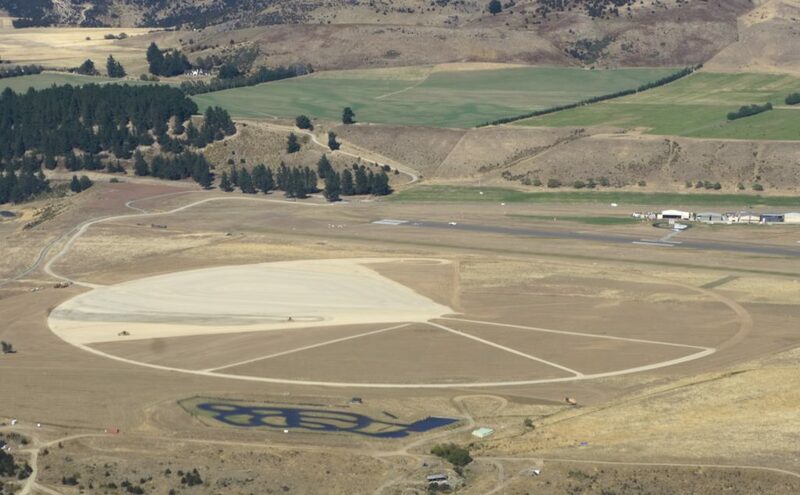 Construction of the new balloon launch pad began Feb. 28 at the Wanaka Airport. Construction on the project began in earnest Feb. 28 to meet a balloon launch date that could be as early as March 25. By the time the project is complete, nearly 2,000 loads of gravel will be trucked in and compacted to form the pad. The four spokes emanating from the center and toward the west, each nearly 1,000 feet (300 meters) long, align with magnetic compass directions at 240, 260, 290 and 320 degrees. On launch day, balloon flight experts from NASA’s Columbia Scientific Balloon Facility will assess meteorological data and determine if the conditions are suitable to support a launch opportunity. If so, the wind direction—reliably toward the east at the Wanaka Airport during the fall—will determine which spoke the team will use to layout the nearly 800-foot-long flight train, which consists of the balloon film (493 feet long/150 meters) and recovery parachute with cable ladder (279 feet long/80 meters). The balloon launch vehicle, a specially outfitted heavy-duty crane, will stage near the center of the circle with the balloon gondola suspended by the crane. After the balloon is inflated and released, the pie-shaped area allows the crane operator room to maneuver and make last second tweaks to ensure the balloon flight train is nearly perpendicular to the ground prior to release/launch. The new pad is the first major project in developing a long-term super pressure balloon launch site in Wanaka. Earlier in 2017, NASA signed a 10-year lease with the Queenstown Airport Corporation to conduct balloon operations from a newly acquired piece of land adjacent to the Wanaka Airport. How many people does it take to unpack a 5,240-pound NASA balloon? 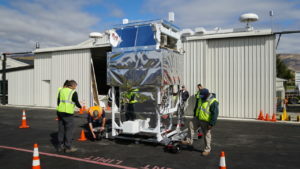 In preparation for NASA’s next Super Pressure Balloon flight from Wanaka, New Zealand, NASA’s balloon team unpacked the top and bottom fittings of the balloon March 17 to perform test and integration work prior to launch. The 18.8-million-cubic-foot (532,000-cubic-meter) balloon is enormous – about the size of a football stadium – when fully inflated. The balloon’s inflated shape is an oblate spheroid, or less technically, it’s the shape of a pumpkin. The fittings are essentially the north and south poles of the spheroid. The top fitting has valves where inflation tubes are connected to the balloon. 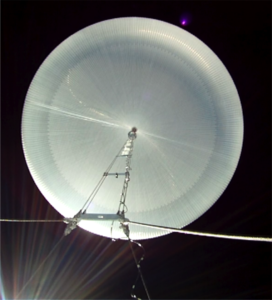 The bottom fitting connects to a parachute, and then the parachute connects to the balloon gondola, which houses the payload and supporting instruments. Given that the balloon is made of 22 acres (8.9 hectares) of polyethylene film and weighs 5,240 pounds (2,377 kilograms), unpacking the balloon is not a trivial activity. Nearly a dozen technicians working different functions carefully opened up the steel-plate-lined shipping box containing the balloon. From there, an overhead crane was used to lift the fittings out while the team worked along either side of the balloon to keep the film safe during the overall operation. NASA is currently targeting no earlier than March 25 for launch. The 2017 mission is a continuation of efforts to test and validate the SPB technology, a technology that could significantly expand flight opportunities for missions requiring long duration flights with day/night exposure in a flight regime that closely mimics space. 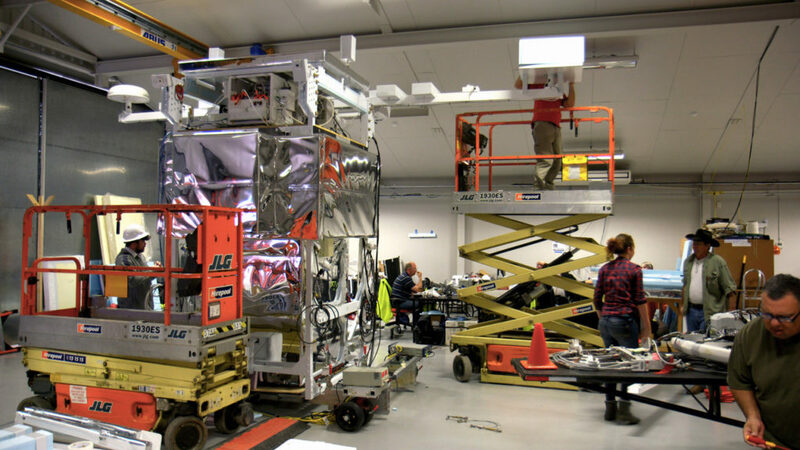 In addition, the balloon team will fly a fluorescence detector and supporting technologies for the University of Chicago’s Extreme Universe Space Observatory, a high-energy cosmic ray particle astrophysics payload. This suborbital flight is a precursor for a mission being planned to launch the EUSO telescope to and install it on the International Space Station (ISS). 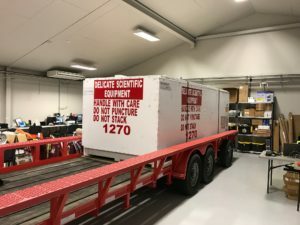 After a globetrotting journey that started in Texas and included stops in Belgium and Singapore, an 18.8 million-cubic-foot (532,000 cubic-meter) super pressure balloon (SPB) arrived in Wanaka, New Zealand, March 9, in preparation for another journey—one that should take it around the world multiple times. This is the third consecutive year NASA has flown the super pressure balloon from Wanaka, which is an ideal location for launching mid-latitude, long duration balloon missions. While the ongoing testing and development of the SPB is the primary focus of this year’s mission, the NASA Scientific Balloon Team is flying the University of Chicago’s Extreme Universe Space Observatory (EUSO-SPB) payload on this year’s balloon mission. 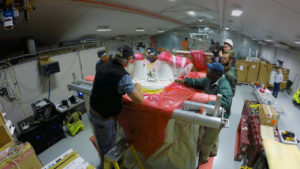 EUSO-SPB is a high-energy cosmic ray particle astrophysics payload that will test a fluorescence detector and its supporting technologies under the severe operating conditions of the stratosphere. This suborbital flight is a precursor for a mission being planned to launch the EUSO telescope to and install it on the International Space Station (ISS). New to the 2017 campaign is the construction of a dedicated balloon launch pad on the northeast side of the Wanaka Airport. This new pad, a 600-meter in diameter large gravel semi-circle, will enable NASA’s balloon launch operations to run seamlessly alongside other airport operations and tenants on launch day. NASA’s SPB is a large structure, about the size of the Forsyth-Barr Stadium in Dunedin, New Zealand, when fully inflated. The balloon is made from polyethylene film, which is similar in appearance and thickness to the type used for sandwich bags, but stronger and more durable. NASA’s Wallops Flight Facility in Virginia manages the agency’s scientific balloon flight program with 10 to 15 flights each year from launch sites worldwide. Orbital ATK, which operates NASA’s Columbia Scientific Balloon Facility, provides mission planning, engineering services and field operations for NASA’s scientific balloon program. The CSBF team has launched more than 1,700 scientific balloons in its over 35 years of operation. For more information on NASA’s Scientific Balloon Program, visit: www.nasa.gov/scientificballoons.